Modern Warfare 3: The Underdog? It's been a season of dueling titans, to be sure. We've got Uncharted 3 vs. Gears of War 3, Skyrim vs. Dark Souls... and of course, Battlefield 3 and Modern Warfare 3. This time last year, the Call of Duty franchise was top dog. Medal of Honor had been vanquished, and the Battlefield 3 promotional machine had yet to grind into action, and the words "eerie verisimilitude" and "lens particles" had not yet entered the popular lexicon. But coming into the fall, things weren't so clear. What if the new guys at Infinity Ward couldn't hack it? What if Battlefield 3 was finally able to become the "COD-killer?" The launch date for Modern Warfare 3 has arrived, and it's time to find out whether the new team at Infinity Ward has what it takes to wear the crown. 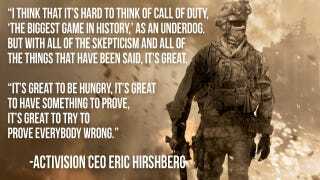 As Activision's Eric Hirshberg (quoted above) told our own Stephen Totilo, it's enough to make the company feel a bit like an underdog. Which is fair, because they're in a bit of an underdog position! At least as far as huge AAA game publishers go. We'll see how it all shakes out soon enough.